Shri. P.R. 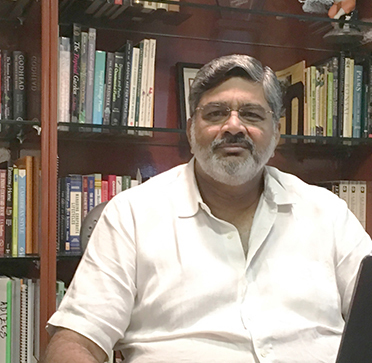 Krishna is the Vice President of the Lalaji Memorial Educational Society, the organization that owns and operates the school, and Chairman of Lalaji Memorial Omega International School. He is also a Trustee of Sahaj Marg Spirituality Foundation, the organization that brought the school into being, by contributing the funds needed for its establishment. Shri. P. Rajagopalachari, Shri. Krishna has been associated with the Mission right from his childhood. Born on May 28, 1957 at Madurai in Tamil Nadu, Shri. Krishna did his schooling at Don Bosco Matriculation School, Egmore in Madras (run by The Salesian Society). He went on to graduate with a B. Tech in Chemical Technology from A. C. College of Technology, Madras, in 1979. Subsequently, he went on to study in the USA in 1979 and graduated with an M.S. in Engineering Administration and an MBA (Marketing) from Syracuse University, New York in December 1982. During this time, he also enrolled for a PhD program in Innovation Management at Syracuse University and was a founder member of the Innovation Management Program. During his tenure at Syracuse University, he taught a variety of subjects at the under-graduate and graduate level. He returned to Madras in 1983, to take a break from his studies. However, circumstances changed, and he never returned to Syracuse to finish the PhD, but stayed back in Madras and started his career. – Lead Assessor, ISO 9000 from Batalas, U.K.
Over the years, his own need to evolve spiritually, together with his need to serve his father, who was President of Shri Ram Chandra Mission, meant that his association with the Mission grew into a full-time engagement. The Mission, which was itself evolving and growing into a multi-national organization, present now in over 125 countries, presented a large number of opportunities. Shri.Krishna utilized these opportunities by learning and acquiring a number of skills including in Architecture and construction, Landscape architecture, Horticulture, administration of non-profit organizations and people management, skills that now stand him in good stead at the school. Shri. Krishna has been associated with the Society that runs the school, and the school itself, from before its inception, and functions as an Executive Chairman, guiding the school through all aspects of its growth.